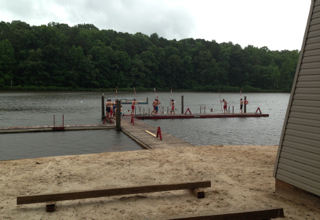 Troop 50 has arrived at Camp Sequoyah and successfully checked in. We are organized with two Birmingham troops into a single unit of 21 scouts. Jeffery is acting as senior patrol leader for the entire group. Despite some light rain, we completed our orientation, medical recheck, and swim test. All of the boys completed the test and are classed as swimmers. Dinner was good although the dinning hall is quite crowded and noisy. Everyone got enough food, however. 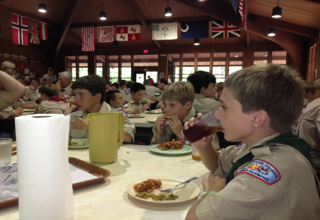 After dinner, the younger scouts attended their Eagle Bound orientation meeting to learn what they would be doing during the week. We also signed up for our afternoon programs. During the week we will be shooting rifle and shotgun, canoeing, and enjoying recreational swims and the water slide. All of the scouts are looking forward to Adventure Valley tomorrow evening. We are about to attend the opening campfire. More photos from the day will be posted tomorrow.